Bill grew up in a military family. His grandfather was a "doughboy" in the First World War. His father and brother were graduates of West Point. His father was a Colonel who served in WWII and Korea. His brother was a Major in the Army. Bill attended Piedmont High School and was active on the stage crew. He served in the Army during the years of military conscription, which were in effect when he was of military age. He could have entered West Point, but elected instead to attend the United States Merchant Marine Academy at Kings Point, New York, from which he graduated with a degree in Mechanical Engineering in 1967. Bill worked for several commercial shipping companies, working his way up to become the Chief Engineer of the Chevron Washington, a 600 foot long double hulled tanker ship operated by the Chevron Oil Company. It was a turbine-electric powered ship with many complicated systems for carrying raw and finished oil products. He represented the company during the original design and construction of the ship and stood by it during several overhauls throughout its life. His ship hauled crude oil from Alaska to refineries in Richmond and El Segundo, CA, and various finished products up and down the California coast and to Hawaii. As a mariner, he was alternately at sea and at home for three month periods. As NorCal Crew Chief, Bill directed a volunteer group of from 8 to 12 members in the restoration and installation of our 41-rank Wurlitzer, which is one of the largest to be installed in any theatre. Radio City Music Hall, in New York, has the only larger original Wurlitzer theatre installation. Our rosewood Wurlitzer console came from the Center Theatre in Radio City. Bill paid for the original Devtronix Organ Control System (computer relay) for our organ and for the commercial overhaul of our Toledo Paramount Publix 1 console by the Crome Organ Company, then in Los Angeles. Bill frequently utilized his long-bed ¾ ton truck in the movement of parts large and small to support the overhaul of the Berkeley organ, including moving the large Toledo console to and from Los Angeles. Bill added the Wurlitzer bombard from the Metropolitan Theatre in Boston, which he purchased specifically to donate to NorCal. He negotiated with various suppliers of parts and services, such as tuning and voicing, and worked with professional organists to design the specifications for the overhaul of both of our consoles. He was constantly purchasing and donating a wide array of hardware and material required for the installation of our organ. Some of Bill's innovations at Berkeley include: 1. The reinstallation of the shutters in horizontal position to better direct sound down from the chambers, 2. Thermostatically controlled constant temperature regulation of the chambers to maintain tuning, 3. Filters in the blower room door to insure that air reaching the blowers is clean, 4. An air pressure regulator mounted on the bottom of the orchestra lift to provide constant wind pressure to the consoles as the lift rises and lowers, 5. Two movable console platforms, one with multi-colored lighting which can be coordinated with stage lighting, 6. The successful installation of our 32 ft diaphones high on the back stage wall, and 7. the installation of two 20 HP wind blowers and a separate 5 HP blower just for the 32 ft diaphones. Bill served terms as Chapter Chairman and as ATOS National Convention Chairman. These NorCal-hosted conventions were attended and enjoyed by many and were very financially successful for NorCal. Over the years he helped Berkeley Community Theatre become an internationally known concert venue. 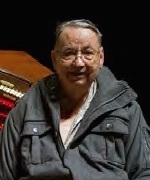 At the time of his passing, Bill was directing the NorCal crew in the restoration of a water damaged 5-rank pipe chest from the Oakland Paramount Wurlitzer. Bill left an endowment to the Paramount for improvements to the organ including adding bombards, restoring the wood diaphones, providing an up to date computer relay system, and having the Crome Organ Company restore and return the original Oakland Paramount "Waterfall" console to the Paramount Theatre. This original Publix 1 console was the last one to be built by Wurlitzer in 1931. Bill suffered from heart disease for many years and had a pacemaker installed five years ago. Last year he was preceded in death by his brother and sister-in-law, who also lived in Oakland. Their passing was a blow to him. He is to be interred in Arlington National Cemetery with his parents and brother. In Bill's memory, the NorCal Board of Directors has struck a brass plate which will be attached to the low C bombard in his memory. He will be sorely missed.